Bistro Truck – New York, NY (@bistrotruck) – Food Truck Talk – Searching for the best foodtrucks! 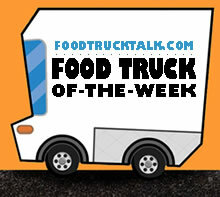 Congratulations to the Bistro Truck as FoodTruckTalk.com’s Food Truck Of-The-Week! In New York City you can find a restaurant serving food from virtually every country in the world! The same is quickly becoming true of New York City food trucks. Moroccan-born Yassir Z. Raouli’s Bistro Truck food truck is dishing out affordable street food with a Moroccan-Mediterranean influence. Yassir prides himself on offering restaurant quality fare. The Bistro Truck menu is large and offers not only Moroccan and Mediterranean influenced dishes but more traditional ones as well. The Bistro Truck offers a few specialty plates including the “Dijon Chicken”, marinated in Meditteranean spices and dijon mustard, and served with either couscous or rice. On the side is a fresh mixed spring salad. The portion size is great, you won’t go hungry! Also available as combo plates are Marrakech lamb or vegetarian vegetable tajine (vegetable stew), also served with couscous or rice and a fresh green salad. 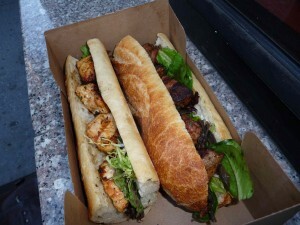 Many claim that the Bistro Truck’s Chicken Brochette sandwich is the best chicken sandwich in New York City! The marinated white chicken cubes are grilled and served on a fresh French baquette and topped with roasted tomato carmelized onions. 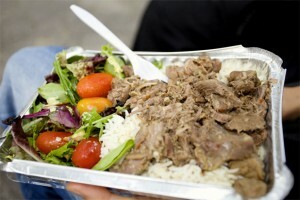 There are not many food trucks serving restaurant qualtiy lamb. It’s a specialty at the Bistro Food Truck where there is a lamb brochette sandwich, a lamb sausage sandwich (Merquez) in addition to the Marrakech lamb plate and various specials of the day. Another unique sandwich is the Tangier Bocadillos, mortadalla, tuna, cheese, hard boiled egg, and mixed vegetable tossed in a non-fat cilantro mayo and served on a baguette. Don’t pass up the burgers! The Bistro Buger features grass fed beef that is seasoned, grilled, and then topped with Roma Plum tomato, lettuce, cheese and the Bistro Truck special sauce. Noshers will appreciate some of the smaller serving size hor doeuvres including salad nicoise, lamb, vegetable or chicken cigars (homemade filo dough stuffed with seasoned ground meat, chicken or vegetables, and the various soups of the day. 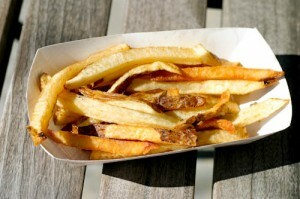 We have to mention The Bistro Truck’s Belgium French Fries, once again, considered some of the finest in NYC! Crunchy and seasoned just right! All in all, The Bistro Truck certainly is a mobile restuarant that achieves their goal of serving restaurant quality food! 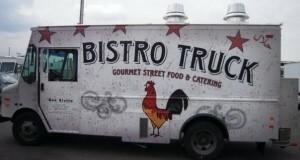 With their varied menu, no matter what you are craving, the Bistro Truck is worth a vist!